Roasted Brussels Sprouts is an easy side dish to make, with delicious nutty flavors and healthy nutrients. 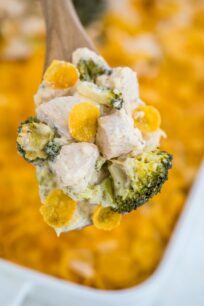 This dish requires only a few ingredients, and it will make a perfect side dish for any holiday or family meal. We love making easy and delicious side dishes, and this one tops the list. It has the perfect mix to be your favorite side dish on the table. It is flavorful, crunchy, healthy, and ease to prepare. To indulge you even more, we recommend you pair them with Garlic Sesame Chicken, Roasted Beef Tenderloin or Slow Cooker Corned Beef. Roasted Brussels Sprouts are flavorful and taste delicious, and go well with any main dishes on the table. The great thing about them is how simple and effortless is to prepare them. You basically take some fresh Brussels sprouts, clean, cut them in half, season with olive oil, salt and pepper, and roast them in the oven. Roasting them is the perfect way to bring out the delicious nutty flavors, and make them crisp and crunchy. We have tried many variations of cooking Brussels sprouts, and we believe that roasting them is the ultimate way to go. If you want to add a little extra flavor to them, add some Parmesan cheese or bacon when cooking. How to make the perfect Roasted Brussels Sprouts? Cut off the brown ends of the brussels sprouts. Pull off any yellow and dry leaves, and slice sprouts in half lengthwise. 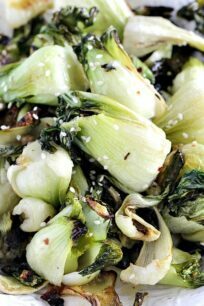 In a large bowl, toss Brussels sprouts with 4 tablespoons of olive oil, kosher salt and pepper, coat well. Next, transfer them to the prepared baking sheet and roast for 35 to 45 minutes, until crisp on the outside and tender on the inside. Taste and season with more kosher salt if needed. Serve warm, sprinkled with some freshly grated parmesan if desired. What’s the difference between cabbage and Brussels sprouts? Even though the Brussels sprouts look like petite cabbages, they are different vegetables. Both are part of the same family, the Brassica family, but are not actually the same veggies. Other members of Brassica family are kale, broccoli, cauliflower, collard greens, turnips, mustard, and bok choy. What should I serve with roasted Brussels sprouts? WHAT ELSE CAN YOU ADD TO ROASTED BRUSSELS SPROUTS? 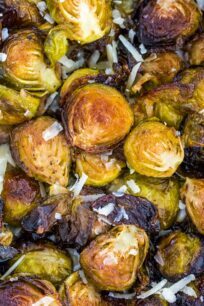 Parmesan Cheese – toss the Brussels sprouts with 1 cup of parmesan cheese before baking or sprinkle some on top right after baking and toss before serving. Bacon – cook bacon in a pan until nice and crispy, mix with the oven roasted Brussels sprouts before serving. 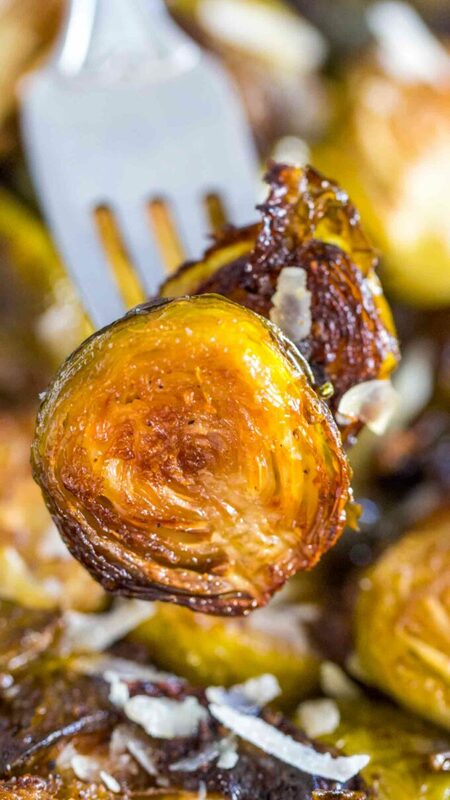 Balsamic Vinegar and honey – mix 3 tablespoons of honey with 3 tablespoons of balsamic vinegar and toss the Brussels sprouts into the mixture right after baking. Garlic – add 1 or 2 tablespoons of garlic powder to the Brussels sprouts before roasting. Hot Pepper Flakes – add 1 teaspoon if hot pepper flakes to the Brussels sprouts before roasting. Should I wash brussel sprouts before cooking? Like any other vegetable, this one is best to be washed. To clean them, trim the ends and rinse in a large bowl of cold water. The dust or any sediments will float to the bottom of the bowl. Once rinsed, transfer them to a colander and pat dry before cooking. Can brussel sprouts be eaten raw? Like cabbage, broccoli, cauliflower, and other vegetables from same family, brussels sprouts can be eatten raw for most people. However, some people experience gas and bloating from difficult-to-digest when eating them. Hence, is best and easier to digest once cooked. Use fresh and organic brussel sprouts. Also, try to pick larger sized Brussels sprouts, because you will cut them in half. Similarly, when cooking them they will reduce in size, so is best to use larger sized sprouts. 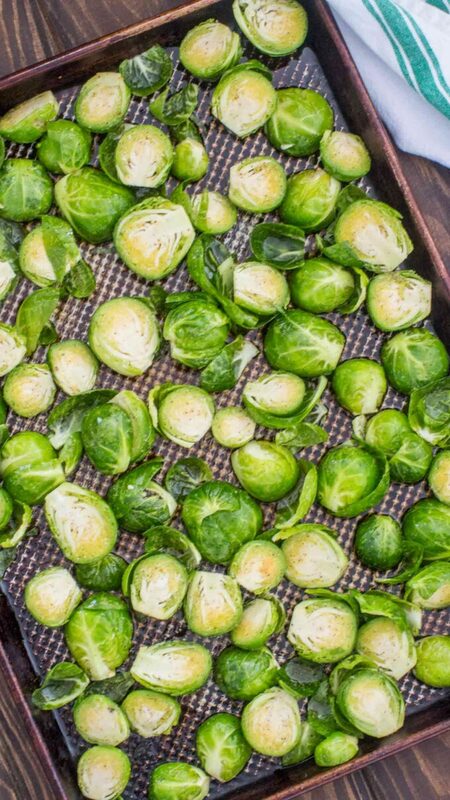 When roasting the brussel sprouts is best to place them directly on a metal baking sheet without any foil or paper. This will make them crispier and crunchier. Don’t overcrowd your pan. Make sure there is some space between them so they cook evenly and have room to breath. Otherwise, they will steam and won’t be as crunchy. In addition, make sure the oven is pre-heated to 425 degrees F before placing them in the oven. To make them crispier, you want to have a high heat. Is best to keep them cut side down when roasting. Roasted Brussels Sprouts is an easy side dish to make, with delicious nutty flavors and healthy nutrients. This dish requires only few ingredients, and it will make the perfect side dish for any holiday or family meal. Cut off the brown ends of the Brussels sprouts, pull off any yellow and dry leaves, and slice Brussels sprouts in half lengthwise. 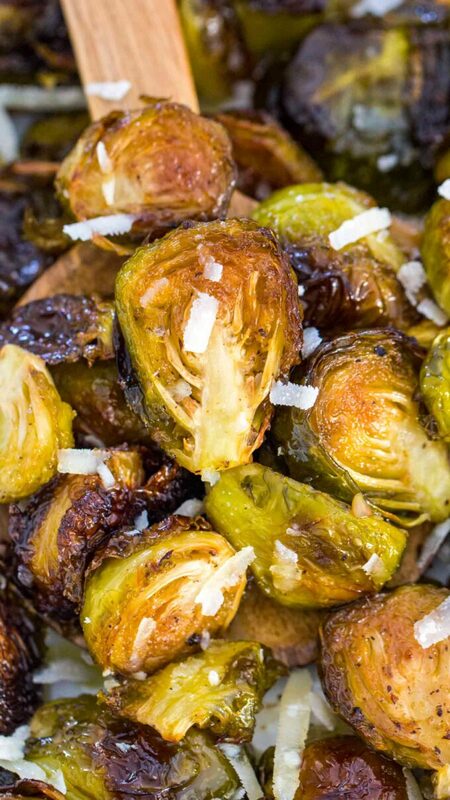 In a large bowl, toss Brussels sprouts with 3 tablespoons of olive oil, kosher salt, pepper, and garlic powder if using, coat well. Transfer them to a large baking sheet lightly greased with olive oil or cooking spray. Roast for 35 to 45 minutes, until crisp on the outside and tender on the inside. Serve warm, sprinkled with grated parmesan if desired. Being vegan I am always looking for a new vegetable to add to my repertoire. This one sounds like one to add to the rotation and the family will love it. I like Brussels Sprouts just about any way they’re prepared. Roasted is one of my favorite ways to enjoy them. 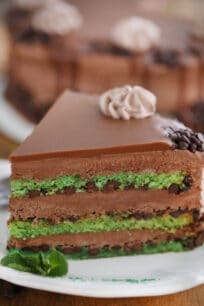 Perfect and simple recipe! These look so good! I bet they would be so fantastic with some mashed potatoes and chicken! In the last few years I have been curious about brussels sprouts again. Are used to hate the message child but nowadays the way they are made I think I would love them. Those look amazing! I actually love brussel sprouts. I know not many do, but I sure do. I’m saving this recipe for later. Thank you for this! I have been wanting to try roasted brussels sprouts but I wasn’t sure how to make them. They look so easy! I love Brussels sprouts and finding new ways to make them. One of my favorite ways is with onion, corn and red pepper flakes! Oh my! How do you make it with corn? I need to find a way to enjoy brussel sprouts – my husband loves them and I try to avoid. This looks like it might be a good one to try! These roasted brussel sprouts are perfect! They have become one of my favorites. I had Brussels sprouts last night! Love it! Need to try your version! Sounds awesome! My husband loves roasted Brussels sprouts. He eats them like candy. They are so easy to prepare.